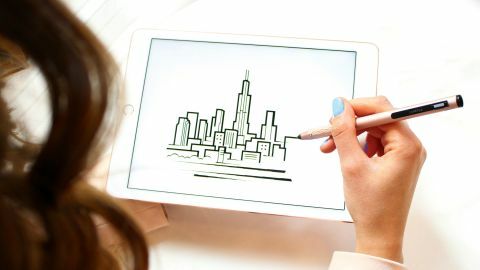 REVIEW: Discover a stylus for iPad or Android that looks good and helps you draw with ease. With a precision nib and a natural feel, Apex Fusion is Lynktec's best stylus yet. Perfect for sketching and more advanced artistic functions. When it comes to styluses to draw or write with on your tablet, not all pens are created equal. The earliest ‘capacitive’ designs took advantage of the inherent electricity in your body to fool tablets into recognising them. Because tablet screens are designed to detect fingertips, these early styluses had thick, stubby tips, which meant drawing with them wasn’t a pleasant experience. Later ‘active’ designs use a built-in battery to generate their own electrical field that the tablet can detect. This means that the physical nibs can be finer. The Apex Fusion is Lynktec’s third attempt at an active stylus, and its best yet. The nib, made from a new polymer created by Lynktec, glides across a tablet display surface and feels entirely natural. The accuracy is good. It feels as though the line is emerging from the nib, rather than the slight gap you get with some styluses, although there was some delay in the line appearing at times. There’s no pressure- sensitivity in the Apex Fusion, but you can achieve a limited degree of line thickness by varying the speed you move the pen. It’s also quite tolerant of being held at an angle to the screen. You can order extra packs of nibs cheaply, although it’s a shame a spare nib wasn’t included with the Apex Fusion to encourage the habit. With the business-like feel of a micro-tip pen, the stylus barrel itself is light and easy to grip, and doesn’t become uncomfortable if you use it for a longer session. The internal battery offers around 14 hours of use per charge; a discrete micro-USB port accepts the provided cable for charging. A simple button on the pen-holder activates the power. With intuitive use and no configuration required, the Apex Fusion is an excellent stylus for sketching, although dedicated artists may still be tempted by the features, particularly pressure-sensitivity and shortcut buttons, that Bluetooth- enabled designs like the slightly more expensive Adonit Pixel provide.